Have I mentioned that I want to manipulate culture or is this too early on to share? Culture as in bacteria and yeast. I’m SO excited! It’s like I’ve entered a magical world where scientists and witchdoctors are friends. I think people in modern day society tend to forget that food has a life before it’s on the supermarket display…that it was attached to a plant which was rooted in the earth and so on. It makes me happy that little friends such as bacteria and yeast still live on our planet and will work for us for a small fee and in return, nourish us to the core. Enough of my far, far away rant. Last week I acquired a kombucha baby from someone at my local co-op and today I tasted it’s progress. It is day 8 of it’s fermentation, and my apartment is warm with no breezes. I couldn’t get past the bubbles! I didn’t expect bubbles until the second fermentation. I kept tasting it and tasting it. It has a hit of acidity after I swallow it, but the initial taste was somewhat sweet. I’m going to taste it every day and wait for some of the sweetness to disappear. For those of you with the inability to google or out of pure laziness, I will educate you of the lovely ugliness that is kombucha. I first heard of it visiting my husband’s late grandfather years ago. He had a fizzy alcoholic, sediment filled liquid in a jar in his refrigerator. He drank it every day. I was very wary of this old world voodoo juice, but I tried a little bit. And I liked it. Now it seems like you can get kombucha bottled in any grocery store, at least in Seattle, and it’s expensive! It’s like $3 for a 12 oz jar. The cost for me to make a gallon of this stuff is one cup of sugar and two tablespoons of green tea. I’ll do a cost analysis later and enter it in for the costing nerds out there. Or you could do it for me. Knowing it is possible to make it at home and being the frugal fraggle that I am, I am out to make my own kombucha revolution in my apartment. Plus it’s fun and satisfying and liberating to make nourishing and healing foods for oneself. 1. Bring 3 liters of filtered water to a boil. Add 2 T of green tea (or 5 tea bags) to the water and steep for 15 minutes. 2. Strain off tea leaves, add one cup of granulated sugar (I like evaporated cane juice). (1 cup sugar on my scale is 7 oz). 3. Stir the sugar so it dissolves. Cool it to 68-77 deg F.
4. Add your starter liquid, stir, add the culture (the pancake, mother, gelatinous blog). 5. Cover the opening with a clean kitchen towel, secure with a rubber band and place in a warm, undisturbed location for about a week. Full sunlight is not desired, but it doesn’t need to be in a closet, just don’t anger the beast. 6. Taste test until slightly acidic and not sweet. With clean hands, remove the blob, place on a clean plate. Save 10% of the liquid and hold the mother and her baby in it until you are ready to make a new batch. They can be separated and given as gifts along with some of the liquid. 7. Bottle the liquid, leaving no airspaces into a glass bottle. Plastic and metal are bad news. Don’t even try it. 8. Wait at least 5 days before cracking the lid and sipping to your soul’s content. It can keep for a few months, apparently the yeast will stop when they are ready and won’t overdo their job. The longer you wait the mellower and drier it will be. Enjoy my current picture, hopefully I’ll bottle it tomorrow with an update. Please share your kombucha stories with me. Has anyone eaten the mother? Kind of cannibalistic but I have an urge to bite it. My next cultural manipulation: tempeh. awaiting the culture in the mail. For those of you at-home fermenters, you will be happy to know that an 8 oz portion of kombucha costs a lovely 14 cents! (plus or minus how much you spend on sugar and tea). The suggested retail for an 8.5 oz jar of Kombucha Wonder Drink is $1.99. Are you amazed? Hi there. 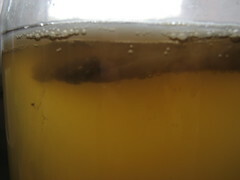 I am interested in brewing my own kombucha tea, just wondering what the starter liquid is and how much do you use? Hi Tara, the rule of thumb is 10% of your liquid should be starter. The starter is just brewed kombucha. So if you get a baby from a friend, they should give you some of the liquid it was pulled from. I typically make 3 liters (about 100 fl oz) so after it’s done with the bulk fermentation, i pull out the mother and babies and put about 10 fl oz with each scoby (if you are separating them). They you hold this aside until you brew the next batch. I usually have the tea ready the day I bottle the previous batch. 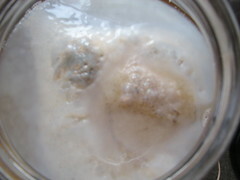 You can find scoby babies from people at your local co-op or somewhere for free. I know there are places you can buy them as well. I can’t vouch for any purchase sites as mine have always been gifted. Updated to add that I have been drinking it after the bulk ferment lately because I can’t wait! It’s a little less fizzy and sweeter but don’t be intimidated..the 5 day second ferment is more of a guideline to me now. I want to add that I have been using tap water with great results. Also, leave 1/4″ headspace when bottling. I like to use those grolsch style bottles. Sometimes I don’t wait the final 5 days and its still good. The final ferment adds more bubbles but I have been impatient lately.